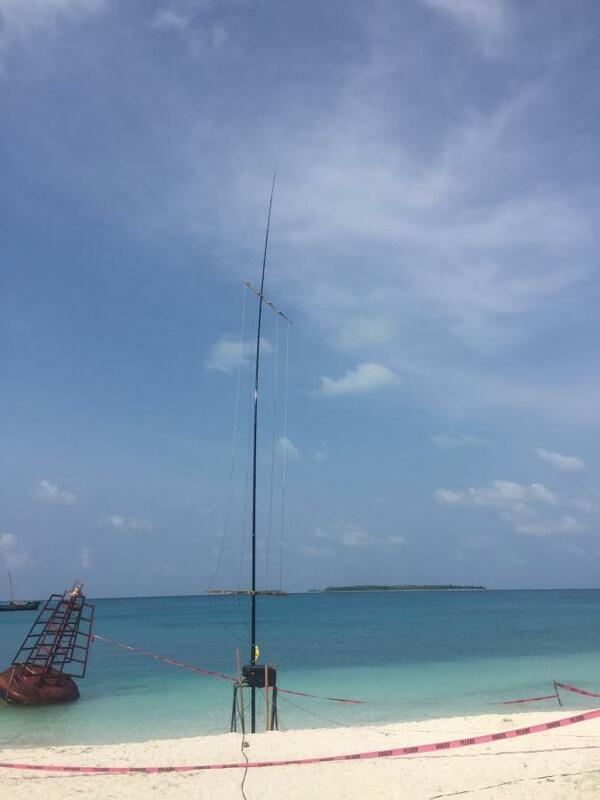 After successful activation of VU7AG in 2013 and VU7KV in 2014, and presenting about the trip at many a meetings, folks in the DX community have asked for an opportunity to go there as a part of the team. Reciprocal amateur radio license process in India is a bit complex. As a first step, one needs a valid Indian Visa. Once the visa is on hand, then an application needs to be filled in and 5 copies will need to be submitted to the Ministry of telecommunications. The approval process cadence involves the Ministry of External Affairs as well as the Home Ministry. These agencies will need to offer a no-objection stamp. Once the no-objection has been received, the Ministry of Telecommunications will issue an Indian callsign , which is locked to the Mainland for the duration of the visa. Now a second application will need to be filed with the Ministry of Telecommunications, requesting temporary shifting of the station from the mainland to VU7 or VU4. Again this activity takes a long time. Licensing in VU is a 2 step process. In December of 2016, we made a trip to New Delhi and VU7. The goal was to pave the way and plan for an international team to visit VU7 in 2017. Laccadive Islands is a string of atolls and are formed from Coral reefs. Agatti is the island where there is an airstrip. An Air India flight from Kochi(on the mainland) takes a little over 1 hour to get to Agatti. The administrative capital is the Island of Kavaratti. The trip from Agatti to Kavaratti is about 2 hours by a ferry. There are a number of islands in the chain. The one noteworthy of mention is Bangaram and Kadamat. Foreigners are allowed to stay in Bangaram, Kadamat and Kavaratti Islands. The Department of Tourism has what is called as a “water Sports Facility”. Entry to any of the islands in the VU7 chain is restricted. Everyone needs an entry permit to visit the Island. The Department of Tourism offers Tourist permit to visit Kavaratti, Bangaram, Kadamat. This requires upfront reservations for the resort facility on these islands. 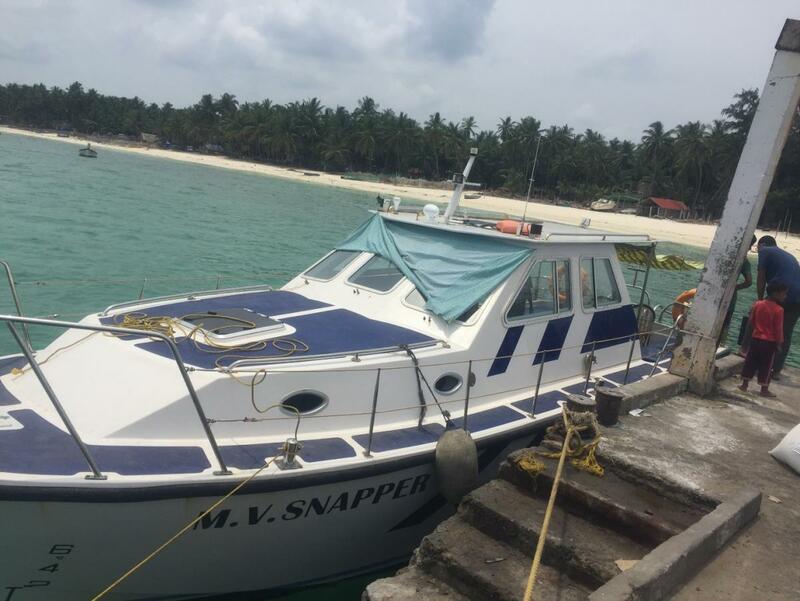 The other islands in the VU7 chain are off limits to foreigners and even Indian tourists. During the past VU7RG expedition in 2007, the resort facility in Agatti was also open. However since then, the resort in Agatti has been under a lawsuit. The Indian government has pretty much taken control of all resorts in the VU7 chain and monopolized it. The 2017 plans to activate VU7 with an international team is underway at this point and the uncertainty still prevails as far as the licensing for the foreign nationals. Our goal is to foster international friendship and good will and bring together the international hams with the Indian ham radio operators. We will continue to work towards this goal. 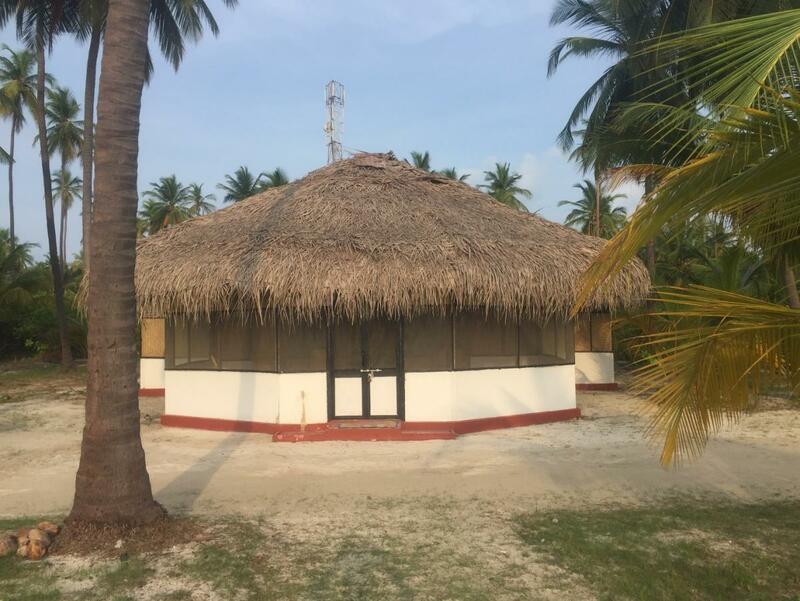 Since Bangaram is only 1 hour from Agatti by a ferry and also has a large facility with around 30 rooms, we chose Bangaram as the location of choice for the future VU7 activation, since foreigners are allowed there. 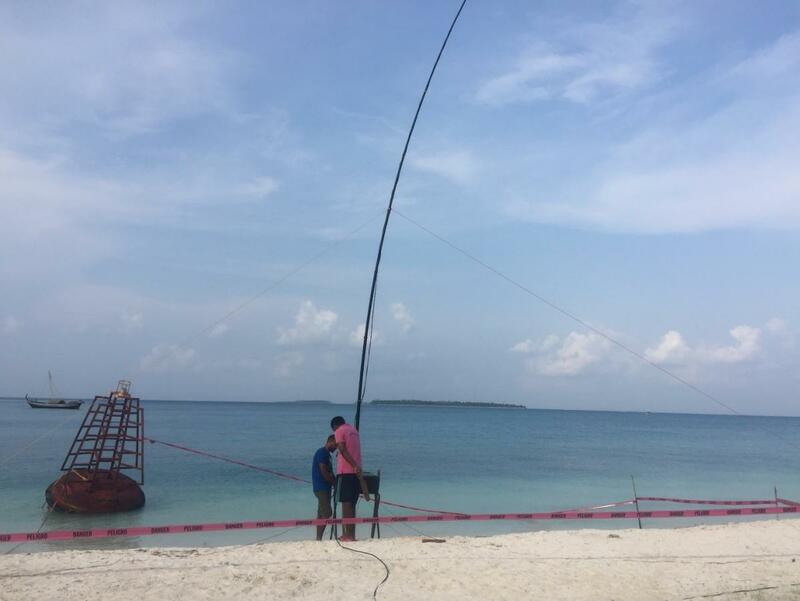 In March of 2017, we received permission to operate from Bangaram Island as VU7KP. The plan was to check out the facilities in the island and also test the radio reception for any local manmade noise sources. The permission allowed VU2PAI (Pai) and VU2VKU (Krish) to operate the station. However, due to a last minute family medical issue, Pai was unable to join. This left Krish to duke it solo this time around from VU7. On May 12, 2017 after finishing the morning QTH work, Krish left North Carolina(USA) and reached India on May 14 at 5am. Once Krish got to his home town at Chennai, he got ready to pack up the essential items needed for the Bangaram trip. Krish’s parents had already shipped the Acom 1000 amplifier, two rolls of coax and a 12m spiderpole to the friends in VU7. The aircraft that flies from Kochi to Agatti has limited cargo capacity. Hence advance planning is required. Krish brought along a MFJ-998RT remote auto tuner from the US along with the wires for the verticals and radials. These items along with the TS-480 were all packed and Krish left Chennai at 4am to head to the airport on May 15th to board the 6am flight to Kochi on the west coast. The flight lasted 1.5 hours. Once in Kochi, we had to check in into the second flight to Agatti. Flying with all the equipment is a challenge every time. One has to explain to the security personnel about the equipment and the purpose. Finally, we board the flight to Agatti which departs at 10:05am. We arrive at Agatti around 11:25am and then it takes about 45 minutes to receive all the luggage. We also received the Acom 1000, the coax cables as well as the 12m fiberglass pole that were shipped earlier. Our friends help us move the gear to the jetty, where we board a ferry( as in picture above) to head to Bangaram. It is summer down in India and the temperatures around 110F with high humidity. Past Mid-May is the onset of monsoon season in VU7 and the monsoon season lasts till late August to early September. As for good luck, we were blessed with good weather and clear skies. The ferry ride takes 1 hour to the island. On arrival at Bangaram, our friends took care of the bungalow that would place us as close to the water’s edge as possible, so the run of coax would be the shortest from the antenna. It was around 2pm and we go and get some lunch. On return, we get some help from our friends to install the vertical and setup the station. It was hot and humid. The station setup does not take much time. We install the MFJ-998RT autotuner on a metal frame to keep it about 3 feet above the ground. We had an inverted L for 80m on the same 12m spiderpole. We also had wires cut for 10/12/15/17/20/30/40m bands all bunched and would around the 12m pole. We run the coax to the antenna and we install “danger” marker tape around the antenna and lay the radials into the water. Bangaram Island. VU7KP Antenna assembly. The rooms in the resort (picture as above) have a problem with power. The outlet was not large enough to handle the amperage requirement of the Acom 1000. The switch to one of the outlets got hot and failed. We had to then move the radio, laptop etc to another outlet and run an extension to power the radio and used a different outlet to power the Acom. Gladly, this did not take much time. 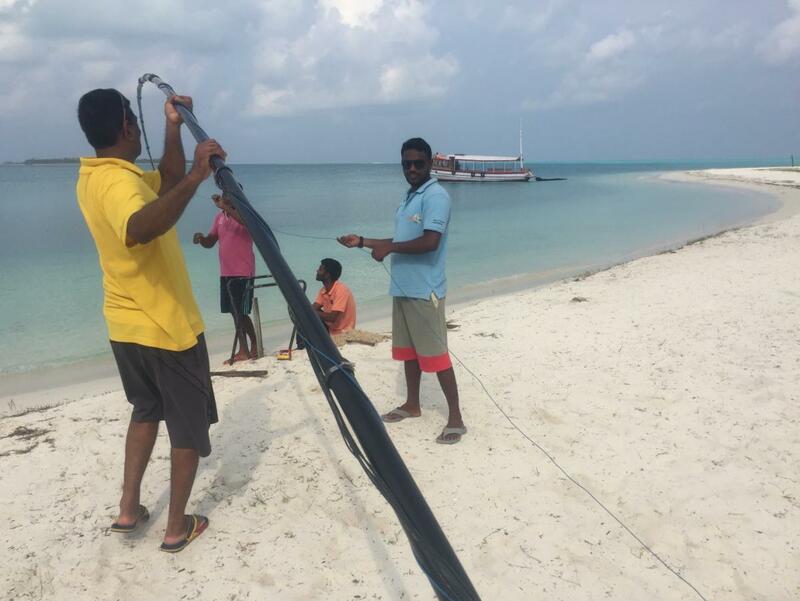 VU7KP Bangaram Island, Laccadive Islands. QRV. 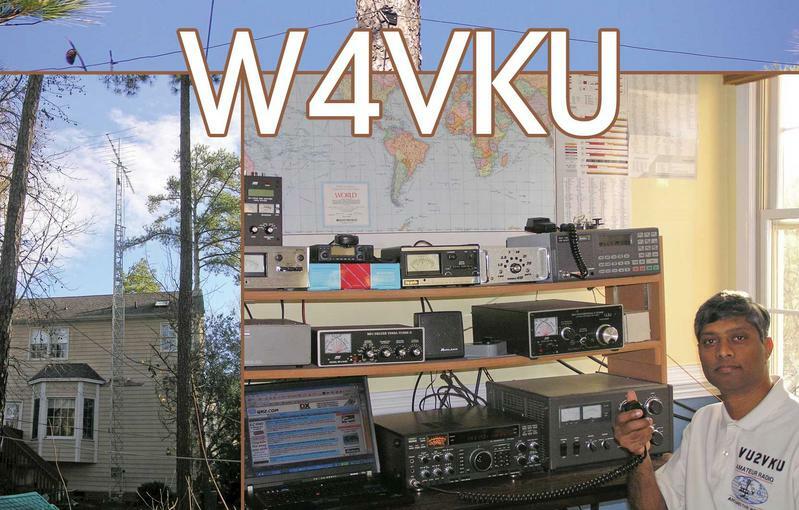 At about 12:21Z (5:51pm IST), we start calling CQ and VU2RAK answers the QSO on 20m. We realized that 20m was not open, so we switched to 17m and then ensured a huge pile up to EU and JA. The MFJ auto tuner worked real well on May 16. On May 17, at around midnight local time, we shut the station down after operating 30m. We had to desperately get some sleep, since I had not yet recovered from the Jet lag of travelling from W4 to VU7. Bangaram resort bungalows do not have any air conditioning. The resort offers bottled water to the tourists. However, for washing and other use, the tap water is less than desirable. The water comes from wells in the island. Due to over use and also since it is the summer time, the water table has dropped. The end result is the incursion of salt water into the water table. Also the island has a lot of Sulphur. The water that is pumped has sulphordioxide and stinks like bad eggs. The color is also light black. However, after leaving the water stagnant for 30 minutes, the sulphordioxide is gone and the stench is not bad. When the water is left to stand for over 24 hours, the color changes to a light green. It is still salty and less than desirable. Outside the bungalow, one has to endure the mosquitos at night. I had reaction to the bites all the way till I returned back to the mainland. Now, back to the station and operation. All was good when we shut the station down on May 16. 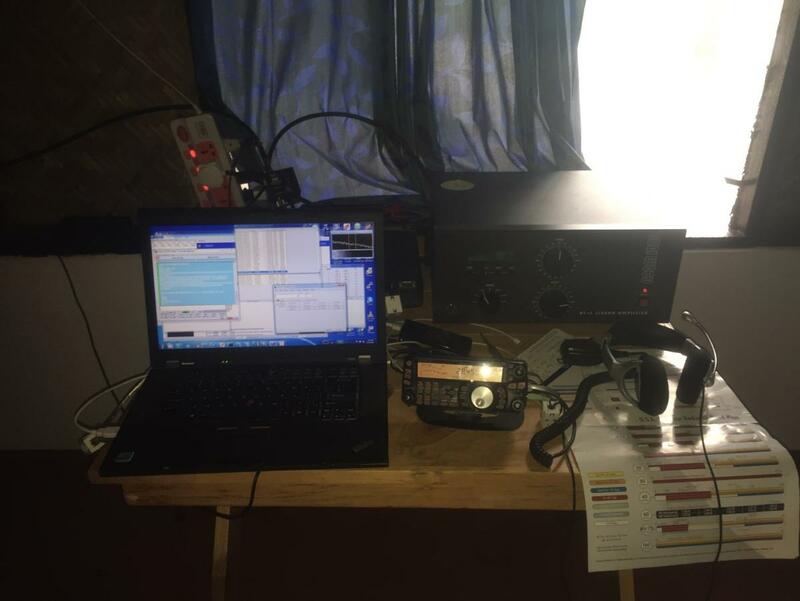 On May 17, we wake up at 4am to start the station on 30m Rtty, since it would be sunrise in the east and the possibility to work JA/VK/ZL etc. To my surprise, the auto tuner would not tune the 30m band that was in use the prior night. We walk up to the antenna, open up the pelican case and notice that the enclosure to the tuner had been on fire at some point. So we return back to the station and go back with a screwdriver to open up the enclosure. On opening, we find that the RF choke that grounds the feed point was all charred. It had gotten hot and since the enclosure for the tuner was very close, it had caught fire. The fire appeared to have also stopped the tuner from tuning the higher bands. We lost the gray line that morning and had to wait for daylight to bring the tuner back into the station and test it to figure out if the tuner can be salvaged for use and on what bands. We then went up to the vertical and cut up the wires and removed the 10m, 12m and 80m wires. We kept the 15/17/20/30/40m wires. We picked up 2 bamboo sticks and separated the vertical wires by 1feet to keep them all as parallel verticals. We then reinstalled the tuner, so we can use the tuner to connect the coax cable to the vertical wires and the tuner would be in bypass mode when no 12v DC is injected, thus acting as a breakout box. We would run up to the vertical and change the wire for the band of interest. Since we only had 1 more day left, we did not spend a lot of time trying to get perfect SWR. We had a fantastic match on 20m. We had 3:1 on all the other bands. Hence we loaded the vertical with the Acom amp and ran lower power. The reconfigured vertical is shown in the picture below. The loss of most part of the day on May 17th did impact the total number of QSO’s. We did operate on May 18th. On May 19th, after the sunrise grayline, we had to start disassembling the station at 7:00am. At 8:30am, all the equipment was on the ferry and we left the island for our trip back to Agatti. Later that evening, we returned back to Chennai and a day later, returned back to W4. The trip resulted in 1800 Qsos. We now know the issues the team will face in Bangaram and are better prepared to handle it. Please look out for the large VU7 operation later this year. If the reciprocal licenses for the international team is received in time, we will add them to the operation. Now as far as the location, in spite of the challenges one will face, the people are so wonderful. They truly care for their guests. In addition, given the size of the lagoon and the clarity of the water, one would not complete their trip without seeing the wonderful coral reefs around the island. 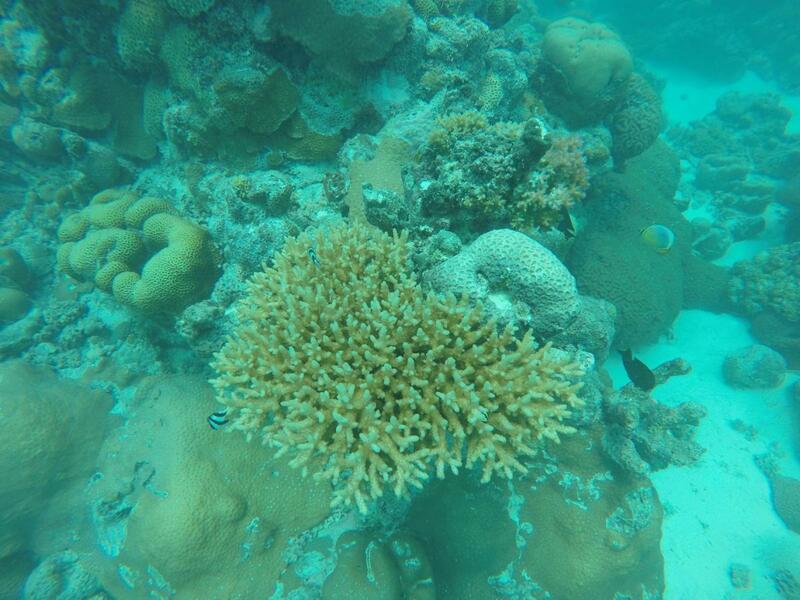 Please see the picture below and the coral was seen at 10m depth. The visibility is fantastic. So any Dxer who goes to Bangaram will be treated with a wonderful watersports experience by the dive team who are a part of the Sports division. I had 2 of my friends accompany me on the dive to take care of me and I am not certified, but have done dives up to 60 ft in the past. I am looking for a few ops from EU to join future operations. The first step is to get a VU license regardless and that takes time. If anyone is a good Op and is interested, please kindly drop me a note. As a final note from my friends at Lakshadweep and the ham radio operators in India, as per the typical Indian tradition, we say “Namaste” and welcome to India.